Hands down… doing dishes by hand. The last two places I have lived haven’t had a dishwasher and I’m sick of it. When I move again, and I will, I require a dishwasher. I hate putting my hands in cold greasy water. I hate that because you usually don’t wash the dishes immediately, they get all crusty and gross. I hate that if you get the water hot enough to clean the greasy residue off plastic containers it burns my hands. I hate that my glasses fog up because of the hot water. I hate that my hands get all pruney when ever I do dishes. I hate washing silverware. They’re small and take a ton of time and you have to do each one, centimeter by centimeter because you put them in your mouth. I hate that when you put it off, it just gets worse. 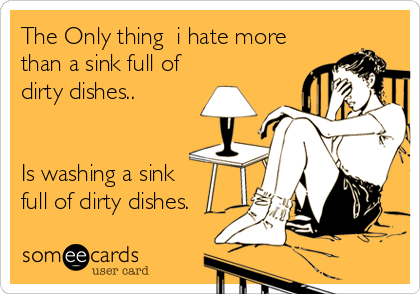 Ugg… hand washing dishes is the worst chore ever!